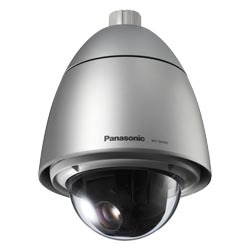 Super Dynamic, Weather Resistant HD network dome camera that provides feature-rich pan-tilt-zoom control, auto-tracking of 720p high-definition (HD) images and full-frame 1280×960-pixel images. 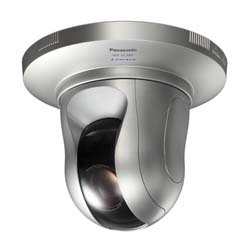 The i-PRO SmartHD WV-SW395A model is a Super Dynamic, Weather Resistant HD network dome camera that provides feature-rich pan-tilt-zoom control, auto-tracking of 720p high-definition (HD) images and full-frame 1280×960-pixel images at up to 30 images per second. It provides multiple H.264 (High profile) and JPEG video streams for simultaneous real-time monitoring and high-resolution recording. 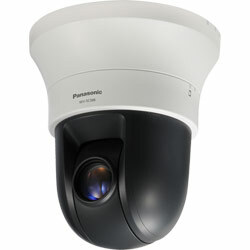 Pan-tilt-zoom (PTZ) control features include a 360-degree map shot that provides the full 360-degree field of view, separated into eight thumbnail images taken at 45-degree intervals. Clicking on any thumbnail easily directs the PTZ camera. 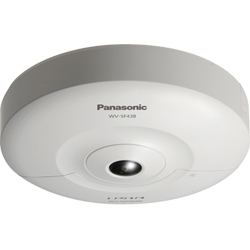 The WV-SW395A dome camera uses Panasonic’s UniPhier® LSI chip (H.264 high-profile format) to combine HD video and real-time video streaming at a lower data size. A new 1.3-megapixel MOS image sensor enables high sensitivity and lower power consumption. To increase user system options, the camera is Open Network Video Interface (ONVIF)-compliant. Image from 16 cameras can be displayed in 4 different Quad screens or 16 split screen (JPEG only). SD Memory Data Download: Still or motion images recorded in the SDHC/SD memory card can be downloaded. Ambient Operating: –40 °C ~ +50 °C (–40 °F ~ 122 °F) (24 V AC) *5. Footnotes: *1 Application software V.1.05 / Driver software V.1.22 or later. The pan/tilt-flip function cannot be activated by clicking live images. When the zoom ratio is adjusted to the “TELE” side, images will be partially hidden even if the pan/tilt-flip function is activated. *2 H.264 and MPEG-4 are alternative. *3 [4 : 3] and [16 : 9] are alternative. *4 Images may partially covered depending on the housing brackets.